^ The Vikings traded their first-round selection (14th overall) and 2018 fourth-round selection to the Philadelphia Eagles in exchange for quarterback Sam Bradford. ^ a b c The Vikings traded their second- and fourth-round selections (48th and 128th overall) to the Cincinnati Bengals in exchange for Cincinnati's second-round selection (41st overall). ^ a b c The Vikings traded their third- and fifth-round selections (79th and 160th overall) to the New York Jets in exchange for the Jets' third-round selection (70th overall). ^ a b c d The Vikings traded their third-round selection (86th overall) to the Kansas City Chiefs in exchange for Kansas City's third-, fourth-, and seventh-round selections (104th, 132nd and 245th overall). ^ a b The Vikings traded their 2016 third-round selection to the Miami Dolphins in exchange for Miami's third- and fourth-round selections (86th and 129th overall). ^ a b c The Vikings traded their third-round selection (104th overall) to the San Francisco 49ers in exchange for San Francisco's fourth- and seventh-round selections (109th and 219th overall). ^ a b c The Vikings traded their fourth-round selection (132nd overall) to the Philadelphia Eagles in exchange for Philadelphia's fourth- and seventh-round selections (139th and 230th overall). ^ a b c The Vikings traded their fourth-round selection (139nd overall) to the Kansas City Chiefs in exchange for Kansas City's two fifth-round selections (170th and 180th overall). ^ a b c d The Vikings traded their sixth- and seventh-round selections (199th and 230th overall) to the Washington Redskins in exchange for Washington's sixth- and seventh-round selections (201st and 220th overall). The Vikings' preliminary preseason schedule was announced on April 10. BUF – Steven Hauschka 42-yard field goal, 14:15. Bills 3–0. Drive: 7 plays, 37 yards, 2:46. MIN – Kai Forbath 36-yard field goal, 3:26. Tied 3–3. Drive: 11 plays, 60 yards, 5:47. MIN – C. J. Ham 2-yard run (Marshall Koehn kick), 10:34. Vikings 10–3. Drive: 7 plays, 69 yards, 3:26. MIN – Rodney Adams 2-yard pass from Taylor Heinicke (Kai Forbath kick), 1:09. Vikings 17–3. Drive: 14 plays, 71 yards, 7:28. BUF – Dezmin Lewis 1-yard pass from Nathan Peterman (Austin Rehkow kick), 10:08. Vikings 17–10. Drive: 13 plays, 79 yards, 6:01. SEA – Kasen Williams 1-yard pass from Russell Wilson (Blair Walsh kick), 9:36. Seahawks 7–0. Drive: 11 plays, 77 yards, 5:24. MIN – Marshall Koehn 29-yard field goal, 3:07. Seahawks 7–3. Drive: 11 plays, 76 yards, 6:29. SEA – Mike Davis 22-yard pass from Russell Wilson (Blair Walsh kick), 1:57. Seahawks 14–3. Drive: 9 plays, 80 yards, 4:07. MIN – Kai Forbath 51-yard field goal, 0:09. Seahawks 14–6. Drive: 10 plays, 41 yards, 1:48. SEA – Blair Walsh 52-yard field goal, 13:51. Seahawks 17–6. Drive: 4 plays, −16 yards, 1:03. SEA – Blair Walsh 52-yard field goal, 5:15. Seahawks 20–6. Drive: 9 plays, 64 yards, 4:29. MIN – Bucky Hodges 21-yard pass from Taylor Heinicke (Marshall Koehn kick), 2:49. Seahawks 20–13. Drive: 6 plays, 81 yards, 1:25. SF – Marquise Goodwin 46-yard pass from Brian Hoyer (Robbie Gould kick), 10:30. 49ers 7–0. Drive: 5 plays, 79 yards, 2:29. SF – Carlos Hyde 24-yard pass from Brian Hoyer (Robbie Gould kick), 14:55. 49ers 14–0. Drive: 10 plays, 88 yards, 5:31. MIN – Marshall Koehn 58-yard field goal, 10:59. 49ers 14–3. Drive: 6 plays, 27 yards, 1:53. SF – Nick Rose 55-yard field goal, 5:32. 49ers 17–3. Drive: 8 plays, 26 yards, 3:07. MIN – Rodney Adams 9-yard pass from Case Keenum (Marshall Koehn kick), 1:43. 49ers 17–10. Drive: 7 plays, 75 yards, 3:49. SF – Raheem Mostert 87-yard pass from C. J. Beathard (Nick Rose kick), 0:49. 49ers 24–10. Drive: 4 plays, 75 yards, 0:54. MIN – Jerick McKinnon 108-yard kickoff return (Marshall Koehn kick), 0:37. 49ers 24–17. Drive: 0 plays, 0 yards, 0:12. SF – Raheem Mostert 4-yard run (Robbie Gould kick), 7:48. 49ers 31–17. Drive: 13 plays, 75 yards, 7:49. MIN – Kyle Carter 16-yard pass from Case Keenum (Marshall Koehn kick), 6:09. 49ers 31–24. Drive: 6 plays, 75 yards, 1:39. MIN – Terrell Newby 1-yard run (Taylor Heinicke run), 0:00. Vikings 32–31. Drive: 14 plays, 63 yards, 2:44. MIA – Kenyan Drake 1-yard run (Andrew Franks kick), 11:07. Dolphins 7–0. Drive: 10 plays, 78 yards, 3:53. MIA – Jakeem Grant 65-yard pass from David Fales (Andrew Franks kick), 12:17. Dolphins 14–0. Drive: 4 plays, 77 yards, 1:30. MIN – Cayleb Jones 8-yard pass from Taylor Heinicke (kick failed, wide left), 7:38. Dolphins 14–6. Drive: 9 plays, 75 yards, 4:39. MIA – MarQueis Gray 6-yard pass from David Fales (Andrew Franks kick), 0:24. Dolphins 21–6. Drive: 10 plays, 80 yards, 1:29. MIA – Taylor Heinicke sacked in the end zone by Praise Martin-Oguike for a safety, 0:12. Dolphins 23–6. MIN – Kai Forbath 24-yard field goal, 14:53. Dolphins 23–9. Drive: 15 plays, 58 yards, 8:37. MIA – Mitch Mathews 19-yard pass from David Fales (Andrew Franks kick), 11:51. Dolphins 30–9. Drive: 8 plays, 70 yards, 3:02. NO – Wil Lutz 43-yard field goal, 8:21. Saints 3–0. Drive: 13 plays, 56 yards, 6:39. MIN – Kai Forbath 24-yard field goal, 1:01. Tied 3–3. Drive: 14 plays, 78 yards, 7:20. NO – Wil Lutz 21-yard field goal, 5:26. Saints 6–3. Drive: 13 plays, 74 yards, 6:49. MIN – Stefon Diggs 18-yard pass from Sam Bradford (Kai Forbath kick), 4:08. Vikings 10–6. Drive: 3 plays, 74 yards, 1:18. MIN – Stefon Diggs 2-yard pass from Sam Bradford (kick failed, wide right), 0:03. Vikings 16–6. Drive: 10 plays, 95 yards, 1:40. MIN – Kai Forbath 32-yard field goal, 11:07. Vikings 19–6. Drive: 8 plays, 54 yards, 3:53. NO – Wil Lutz 24-yard field goal, 2:43. Vikings 19–9. Drive: 8 plays, 83 yards, 2:46. MIN – Kyle Rudolph 15-yard pass from Sam Bradford (Kai Forbath kick), 12:52. Vikings 26–9. Drive: 9 plays, 89 yards, 4:51. NO – Wil Lutz 20-yard field goal, 7:49. Vikings 26–12. Drive: 12 plays, 73 yards, 5:03. MIN – Kai Forbath 45-yard field goal, 4:00. Vikings 29–12. Drive: 8 plays, 48 yards, 3:49. NO – Coby Fleener 8-yard pass from Drew Brees (Wil Lutz kick), 1:56. Vikings 29–19. Drive: 8 plays, 75 yards, 2:04. PIT – Martavis Bryant 27-yard pass from Ben Roethlisberger (Chris Boswell kick), 3:02. Steelers 7–0. Drive: 9 plays, 78 yards, 5:43. PIT – JuJu Smith-Schuster 4-yard pass from Ben Roethlisberger (Chris Boswell kick), 13:31. Steelers 14–0. Drive: 5 plays, 60 yards, 3:12. MIN – Kai Forbath 42-yard field goal, 8:50. Steelers 14–3. Drive: 11 plays, 51 yards, 4:41. PIT – Chris Boswell 46-yard field goal, 12:19. Steelers 17–3. Drive: 4 plays, 8 yards, 2:06. MIN – C. J. Ham 1-yard run (kick failed, wide left), 9:57. Steelers 17–9. Drive: 6 plays, 82 yards, 2:22. PIT – Chris Boswell 29-yard field goal, 5:05. Steelers 20–9. Drive: 10 plays, 74 yards, 4:52. PIT – Chris Boswell 37-yard field goal, 3:18. Steelers 23–9. Drive: 11 plays, 64 yards, 4:44. PIT – Chris Boswell 43-yard field goal, 1:53. Steelers 26–9. Drive: 4 plays, 5 yards, 0:20. MIN – Dalvin Cook 1-yard run (Kai Forbath kick), 10:58. Vikings 7–0. Drive: 7 plays, 75 yards, 4:02. TB – Nick Folk 40-yard field goal, 6:18. Vikings 7–3. Drive: 8 plays, 53 yards, 4:40. MIN – Jarius Wright 2-yard pass from Case Keenum (Kai Forbath kick), 10:25. Vikings 14–3. Drive: 13 plays, 76 yards, 5:57. MIN – Stefon Diggs 17-yard pass from Case Keenum (Kai Forbath kick), 0:47. Vikings 21–3. Drive: 6 plays, 92 yards, 3:04. MIN – Stefon Diggs 59-yard pass from Case Keenum (Kai Forbath kick), 12:25. Vikings 28–3. Drive: 3 plays, 66 yards, 1:03. TB – Cameron Brate 15-yard pass from Jameis Winston (Nick Folk kick), 8:47. Vikings 28–10. Drive: 6 plays, 46 yards, 3:38. MIN – Kai Forbath 20-yard field goal, 2:24. Vikings 31–10. Drive: 13 plays, 73 yards, 6:23. TB – DeSean Jackson 25-yard pass from Jameis Winston (Nick Folk kick), 0:00. Vikings 31–17. Drive: 7 plays, 75 yards, 2:24. MIN – Kai Forbath 37-yard field goal, 8:40. Vikings 34–17. Drive: 6 plays, 16 yards, 3:45. DET – Matt Prater 29-yard field goal, 10:47. Lions 3–0. Drive: 15 plays, 82 yards, 8:02. MIN – Dalvin Cook 5-yard run (Kai Forbath kick), 1:07. Vikings 7–3. Drive: 11 plays, 81 yards, 4:33. DET – Matt Prater 37-yard field goal, 10:41. Vikings 7–6. Drive: 8 plays, 29 yards, 3:37. DET – Ameer Abdullah 3-yard run (Matthew Stafford–T. J. Jones pass), 8:00. Lions 14–7. Drive: 5 plays, 29 yards, 2:25. CHI – Sam Bradford sacked in the end zone by Leonard Floyd for a safety, 1:31. Bears 2–0. MIN – Kai Forbath 26-yard field goal, 1:02. Vikings 3–2. Drive: 4 plays, 5 yards, 1:26. MIN – Kyle Rudolph 13-yard pass from Case Keenum (Kai Forbath kick), 8:16. Vikings 10–2. Drive: 13 plays, 75 yards, 6:44. CHI – Benny Cunningham 38-yard pass from Pat O'Donnell (Connor Barth kick), 5:23. 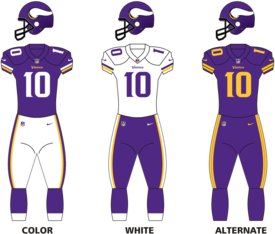 Vikings 10–9. Drive: 7 plays, 75 yards, 2:53. MIN – Jerick McKinnon 58-yard run (Kai Forbath kick), 3:31. Vikings 17–9. Drive: 5 plays, 82 yards, 1:52. CHI – Zach Miller 20-yard pass from Mitchell Trubisky (Mitchell Trubisky run), 12:24. Tied 17–17. Drive: 11 plays, 79 yards, 6:07. MIN – Kai Forbath 26-yard field goal, 0:12. Vikings 20–17. Drive: 6 plays, 20 yards, 2:08. MIN – Jerick McKinnon 27-yard pass from Case Keenum (Kai Forbath kick), 14:53. Vikings 7–0. Drive: 2 plays, 42 yards, 0:11. GB – Davante Adams 14-yard pass from Brett Hundley (Mason Crosby kick), 10:40. Tied 7–7. Drive: 3 plays, 18 yards, 1:24. MIN – Jerick McKinnon 3-yard run (Kai Forbath kick), 7:22. Vikings 14–7. Drive: 8 plays, 84 yards, 3:18. GB – Mason Crosby 26-yard field goal, 1:51. Vikings 14–10. Drive: 7 plays, 30 yards, 2:11. MIN – Kai Forbath 36-yard field goal, 9:35. Vikings 17–10. Drive: 12 plays, 57 yards, 5:25. MIN – Kai Forbath 34-yard field goal, 14:57. Vikings 20–10. Drive: 11 plays, 66 yards, 5:16. MIN – Kai Forbath 53-yard field goal, 10:47. Vikings 23–10. Drive: 4 plays, 0 yards, 1:29. BAL – Justin Tucker 48-yard field goal, 8:30. Ravens 3–0. Drive: 9 plays, 35 yards, 4:11. MIN – Kai Forbath 52-yard field goal, 3:39. Tied 3–3. Drive: 12 plays, 41 yards, 4:51. MIN – Kai Forbath 51-yard field goal, 12:55. Vikings 6–3. Drive: 8 plays, 38 yards, 2:50. BAL – Justin Tucker 57-yard field goal, 9:56. Tied 6–6. Drive: 6 plays, 33 yards, 2:59. MIN – Kai Forbath 43-yard field goal, 0:35. Vikings 9–6. Drive: 15 plays, 60 yards, 7:01. MIN – Kai Forbath 43-yard field goal, 10:53. Vikings 12–6. Drive: 7 plays, 50 yards, 4:07. MIN – Latavius Murray 29-yard run (kick failed, hit right upright), 7:58. Vikings 18–6. Drive: 3 plays, 45 yards, 1:21. BAL – Justin Tucker 47-yard field goal, 2:58. Vikings 18–9. Drive: 10 plays, 46 yards, 5:00. MIN – Kai Forbath 34-yard field goal, 11:54. Vikings 21–9. Drive: 6 plays, 35 yards, 2:15. MIN – Kai Forbath 32-yard field goal, 3:03. Vikings 24–9. Drive: 12 plays, 64 yards, 6:47. BAL – Chris Moore 13-yard pass from Joe Flacco (Justin Tucker kick), 0:00. Vikings 24–16. Drive: 14 plays, 68 yards, 3:03. WAS – Maurice Harris 36-yard pass from Kirk Cousins (Nick Rose kick), 10:57. Redskins 7–0. Drive: 7 plays, 75 yards, 4:03. MIN – Latavius Murray 1-yard run (Kai Forbath kick), 8:18. Tied 7–7. Drive: 5 plays, 75 yards, 2:39. WAS – Nick Rose 28-yard field goal, 0:08. Redskins 10–7. Drive: 10 plays, 52 yards, 4:33. MIN – Stefon Diggs 3-yard pass from Case Keenum (Kai Forbath kick), 11:45. Vikings 14–10. Drive: 9 plays, 75 yards, 3:23. WAS – Kirk Cousins 1-yard run (Nick Rose kick), 4:37. Redskins 17–14. Drive: 13 plays, 60 yards, 7:08. MIN – Adam Thielen 7-yard pass from Case Keenum (Kai Forbath kick), 1:49. Vikings 21–17. Drive: 6 plays, 71 yards, 2:48. MIN – David Morgan II 1-yard pass from Case Keenum (Kai Forbath kick), 0:22. Vikings 28–17. Drive: 3 plays, 23 yards, 1:16. MIN – Jarius Wright 7-yard pass from Case Keenum (Kai Forbath kick), 12:22. Vikings 35–17. Drive: 6 plays, 72 yards, 2:38. WAS – Nick Rose 21-yard field goal, 8:24. Vikings 35–20. Drive: 11 plays, 69 yards, 3:58. WAS – Kirk Cousins 2-yard run (Nick Rose kick), 14:47. Vikings 35–27. Drive: 2 plays, 2 yards, 0:06. MIN – Kai Forbath 53-yard field goal, 7:45. Vikings 38–27. Drive: 13 plays, 40 yards, 7:02. WAS – Nick Rose 55-yard field goal, 1:14. Vikings 38–30. Drive: 13 plays, 41 yards, 2:29. LAR – Todd Gurley 6-yard run (Greg Zuerlein kick), 10:42. Rams 7–0. Drive: 9 plays, 75 yards, 4:18. MIN – Latavius Murray 8-yard run (Kai Forbath kick), 13:31. Tied 7–7. Drive: 7 plays, 30 yards, 3:09. MIN – Latavius Murray 2-yard run (Kai Forbath kick), 14:15. Vikings 14–7. Drive: 11 plays, 71 yards, 6:01. MIN – Adam Thielen 65-yard pass from Case Keenum (Kai Forbath kick), 10:14. Vikings 21–7. Drive: 5 plays, 93 yards, 2:23. MIN – Kai Forbath 39-yard field goal, 2:23. Vikings 24–7. Drive: 12 plays, 64 yards, 5:55. MIN – Kyle Rudolph 1-yard pass from Case Keenum (kick blocked), 5:29. Vikings 6–0. Drive: 14 plays, 80 yards, 6:59. MIN – Case Keenum 9-yard run (Kai Forbath kick), 3:55. Vikings 13–0. Drive: 3 plays, 39 yards, 0:56. DET – Matt Prater 32-yard field goal, 10:15. Vikings 13–3. Drive: 12 plays, 69 yards, 5:33. MIN – Kyle Rudolph 22-yard pass from Case Keenum (Kai Forbath kick), 0:37. Vikings 20–3. Drive: 5 plays, 74 yards, 1:21. DET – Marvin Jones 6-yard pass from Matthew Stafford (Matt Prater kick), 0:10. Vikings 20–10. Drive: 3 plays, 75 yards, 0:27. MIN – Latavius Murray 2-yard run (Kai Forbath kick), 12:52. Vikings 27–10. Drive: 4 plays, 75 yards, 2:08. DET – Matt Prater 32-yard field goal, 7:08. Vikings 27–13. Drive: 12 plays, 61 yards, 5:44. DET – Matt Prater 50-yard field goal, 1:03. Vikings 27–16. Drive: 8 plays, 40 yards, 4:01. DET – Marvin Jones 43-yard pass from Matthew Stafford (Matt Prater kick), 14:16. Vikings 27–23. Drive: 3 plays, 39 yards, 0:33. MIN – Kai Forbath 36-yard field goal, 3:42. Vikings 30–23. Drive: 9 plays, 45 yards, 2:39. ATL – Matt Bryant 38-yard field goal, 5:24. Falcons 3–0. Drive: 15 plays, 58 yards, 7:24. MIN – Jerick McKinnon 2-yard pass from Case Keenum (Kai Forbath kick), 10:01. Vikings 7–3. Drive: 9 plays, 53 yards, 5:04. ATL – Matt Bryant 36-yard field goal, 5:47. Vikings 7–6. Drive: 8 plays, 65 yards, 4:14. ATL – Matt Bryant 47-yard field goal, 11:57. Falcons 9–7. Drive: 7 plays, 46 yards, 3:03. MIN – Kyle Rudolph 6-yard pass from Case Keenum (Kai Forbath kick), 14:56. Vikings 14–9. Drive: 15 plays, 89 yards, 8:15. CAR – Jonathan Stewart 60-yard run (Graham Gano kick), 10:55. Panthers 7–0. Drive: 3 plays, 69 yards, 1:35. MIN – Kyle Rudolph 18-yard pass from Case Keenum (Kai Forbath kick), 6:28. Tied 7–7. Drive: 10 plays, 75 yards, 4:27. CAR – Jonathan Stewart 1-yard run (Graham Gano kick), 14:16. Panthers 14–7. Drive: 14 plays, 89 yards, 7:12. MIN – Kai Forbath 30-yard field goal, 5:02. Panthers 14–10. Drive: 9 plays, 62 yards, 4:03. MIN – Kai Forbath 22-yard field goal, 0:07. Panthers 14–13. Drive: 11 plays, 64 yards, 2:26. CAR – Devin Funchess 18-yard pass from Cam Newton (Graham Gano kick), 8:42. Panthers 21–13. Drive: 10 plays, 75 yards, 6:18. CAR – Graham Gano 41-yard field goal, 6:51. Panthers 24–13. Drive: 4 plays, 8 yards, 1:37. MIN – Adam Thielen 52-yard pass from Case Keenum (Case Keenum–Blake Bell pass), 5:36. Panthers 24–21. Drive: 4 plays, 73 yards, 1:28. MIN – Kai Forbath 27-yard field goal, 3:07. Tied 24–24. Drive: 4 plays, −3 yards, 1:29. CAR – Jonathan Stewart 1-yard run (Graham Gano kick), 1:47. Panthers 31–24. Drive: 5 plays, 75 yards, 1:20. MIN – Latavius Murray 1-yard run (Kai Forbath kick), 10:31. Vikings 7–0. Drive: 9 plays, 75 yards, 4:29. MIN – Eric Kendricks 31-yard interception return (Kai Forbath kick), 5:54. Vikings 14–0. MIN – Kai Forbath 53-yard field goal, 1:30. Vikings 17–0. Drive: 4 plays, 3 yards, 2:10. MIN – Stefon Diggs 20-yard pass from Case Keenum (Kai Forbath kick), 6:41. Vikings 24–0. Drive: 8 plays, 77 yards, 4:24. MIN – Kai Forbath 35-yard field goal, 6:34. Vikings 27–0. Drive: 10 plays, 71 yards, 5:29. MIN – Kyle Rudolph 1-yard pass from Case Keenum (Kai Forbath kick), 12:53. Vikings 34–0. Drive: 7 plays, 83 yards, 3:38. CIN – Giovani Bernard 2-yard run (Randy Bullock kick), 6:22. Vikings 34–7. Drive: 6 plays, 23 yards, 2:56. MIN – Kai Forbath 49-yard field goal, 8:28. Vikings 3–0. Drive: 9 plays, 39 yards, 3:50. MIN – Stefon Diggs 4-yard pass from Case Keenum (Kai Forbath kick), 0:56. Vikings 10–0. Drive: 5 plays, 68 yards, 2:09. MIN – Kai Forbath 20-yard field goal, 1:20. Vikings 13–0. Drive: 12 plays, 62 yards, 6:12. MIN – Kai Forbath 27-yard field goal, 2:56. Vikings 16–0. Drive: 4 plays, 5 yards, 1:00. MIN – Latavius Murray 1-yard run (Kai Forbath kick), 9:07. Vikings 7–0. Drive: 7 plays, 70 yards, 3:45. MIN – Latavius Murray 1-yard run (Kai Forbath kick), 9:30. Vikings 14–0. Drive: 11 plays, 71 yards, 6:08. CHI – Bryce Callahan 59-yard punt return (Mike Nugent kick), 5:50. Vikings 14–7. MIN – Penalty on Mitchell Trubisky enforced in the end zone for a safety, 2:25. Vikings 16–7. MIN – Stefon Diggs 15-yard pass from Case Keenum (Kai Forbath kick), 0:14. Vikings 23–7. Drive: 7 plays, 63 yards, 3:36. CHI – Mike Nugent 55-yard field goal, 8:22. Vikings 23–10. Drive: 5 plays, 11 yards, 1:31. NO - Wil Lutz 43-yard field goal, 0:25. Saints 24–23. Drive: 11 plays, 50 yards, 1:04. With their win against the Saints in the NFC Divisional Round, Minnesota became the first team in the Super Bowl era to advance to the conference championship game the same year they hosted the Super Bowl. Despite going to Lincoln Financial Field as three-point favorites, primarily due to a general lack of confidence in Eagles second-string quarterback Nick Foles, the Vikings lost in a massive upset to the number 1 seeded Philadelphia Eagles by a score of 38–7. Although the Vikings took an early lead on their opening drive via a pass from Case Keenum to Kyle Rudolph, the Eagles leveled the scores on a 50-yard Patrick Robinson interception return before scoring a further 31 unanswered points over the final three quarters. This loss extended the Vikings NFC title drought to 42 seasons, the longest in the NFL. Four Vikings players were elected to the Pro Bowl when the rosters were announced on December 19, 2017, with three-time selection Everson Griffen, two-time selection Xavier Rhodes and first-timer Adam Thielen all named as starters, while Griffen's fellow third-timer Anthony Barr was named on the bench at outside linebacker behind the Cardinals' Chandler Jones and the Redskins' Ryan Kerrigan. Safety Harrison Smith was rated as the best safety in the league by Pro Football Focus over the course of the season, but was not included in the roster for the Pro Bowl, leading to some considering him to be one of the biggest snubs of the season. Smith was eventually named to the NFC's Pro Bowl roster on January 22, after New York Giants safety Landon Collins withdrew due to injury. Kyle Rudolph was also included after Jimmy Graham pulled out with an injury, while Linval Joseph took the place of the Super Bowl-bound Philadelphia Eagles' Fletcher Cox. Smith will be appearing in his third straight Pro Bowl, while Rudolph and Joseph are appearing in their second career Pro Bowls. Barr and Griffen also pulled out of the Pro Bowl due to injury, replaced by Thomas Davis and Michael Bennett respectively. ^ "Vikings trade for Eagles QB Sam Bradford". ESPN. September 3, 2016. Retrieved September 3, 2016. ^ a b c d e f g "2017 NFL Draft trade tracker: Details of all the moves". NFL.com. National Football League. April 27, 2017. Retrieved April 27, 2017. ^ "2016 NFL Draft trade tracker: Details of all the moves". NFL.com. April 29, 2016. Retrieved April 30, 2016. ^ Peters, Craig (January 2, 2017). "Vikings Sign 9 Practice Squad Players to Futures Contracts". Vikings.com. Minnesota Vikings Football. Retrieved February 11, 2017. ^ Peters, Craig (March 8, 2017). "Vikings re-sign Jeremiah Sirles". Vikings.com. Minnesota Vikings Football. Retrieved March 8, 2017. ^ Peters, Craig (March 15, 2017). "Vikings Agree to Terms with Terence Newman". Vikings.com. Minnesota Vikings Football. Retrieved March 15, 2017. ^ Wesseling, Chris (March 15, 2017). "Vikings bring back Adam Thielen on three-year deal". NFL.com. National Football League. Retrieved March 15, 2017. ^ Graff, Chad (March 24, 2017). "Vikings' Brian Robison agrees to pay cut in one-year contract extension". TwinCities.com. Digital First Media. Retrieved March 24, 2017. ^ Peters, Craig (February 10, 2017). "Vikings Release Brandon Fusco, Mike Harris". Vikings.com. Minnesota Vikings Football. Retrieved February 11, 2017. ^ Peters, Craig (March 6, 2017). "Chad Greenway Ending Vikings Career His Way". Vikings.com. Minnesota Vikings Football. Retrieved March 7, 2017. ^ Elsen, Michael (March 10, 2017). "New York Giants sign TE Rhett Ellison". giants.com. New York Giants. Retrieved March 10, 2017. ^ Strickland, Bryan (March 10, 2017). "Panthers sign Matt Kalil". panthers.com. Carolina Panthers. Retrieved March 10, 2017. ^ Bowen, Kevin (March 10, 2017). "Meet Pat McAfee's Replacement: New Colts Punter Jeff Locke". colts.com. Colts. Retrieved March 10, 2017. ^ Henson, Max (March 10, 2017). "Panthers sign WR Charles Johnson". panthers.com. Carolina Panthers. Retrieved March 10, 2017. ^ Henson, Max (March 11, 2017). "Panthers sign CB Captain Munnerlyn". panthers.com. Carolina Panthers. Retrieved March 11, 2017. ^ "Jaguars sign linebacker Audie Cole as unrestricted free agent". jaguars.com. Jacksonville Jaguars. March 11, 2017. Retrieved March 11, 2017. ^ Goessling, Ben (March 14, 2017). "Raiders, Cordarrelle Patterson reach agreement on deal". ESPN.com. ESPN Internet Ventures. Retrieved March 14, 2017. ^ Peters, Craig (May 16, 2017). "Vikings Sign Rookie Offensive Lineman". Vikings.com. Retrieved May 16, 2017. ^ Peters, Craig (May 31, 2017). "Vikings Sign Former Nebraska QB Tommy Armstrong as a Safety". Vikings.com. Retrieved May 31, 2017. ^ Peters, Craig (January 3, 2017). "Vikings Sign 3 Free Agents to Futures Contracts". Vikings.com. Minnesota Vikings Football. Retrieved February 11, 2017. ^ Smith, Eric (March 10, 2017). "Vikings Sign Offensive Tackle Riley Reiff". Vikings.com. Minnesota Vikings Football. Retrieved March 10, 2017. ^ Smith, Eric (March 10, 2017). "Vikings Sign Offensive Tackle Mike Remmers". Vikings.com. Minnesota Vikings Football. Retrieved March 10, 2017. ^ Conway, Tyler (March 14, 2017). "DATONE JONES, MINNESOTA VIKINGS AGREE TO CONTRACT AFTER 4 YEARS WITH PACKERS". Bleacher Report. Retrieved March 14, 2017. ^ Smith, Eric (March 16, 2017). "Vikings Sign Running Back Latavius Murray". Vikings.com. Minnesota Vikings Football. Retrieved March 16, 2017. ^ Peters, Craig (March 30, 2017). "Vikings Bring Back Terrell Sinkfield as a Cornerback, Add WR & TE". Vikings.com. Minnesota Vikings Football. Retrieved March 30, 2017. ^ Peters, Craig (April 3, 2017). "Vikings Sign QB Case Keenum". Vikings.com. Minnesota Vikings Football. Retrieved April 3, 2017. ^ "Vikings Sign Punter Ryan Quigley". Vikings.com. Minnesota Vikings Football. April 3, 2017. Retrieved April 3, 2017. ^ "Vikings Sign Former Bears DT Will Sutton". Vikings.com. May 17, 2017. Retrieved May 17, 2017. ^ "Four Vikings Selected to the 2018 Pro Bowl". Vikings.com. Minnesota Vikings Football. December 19, 2017. Retrieved January 22, 2018. ^ "NFL announces 2018 Pro Bowl rosters". NFL.com. National Football League. December 19, 2017. Retrieved January 22, 2018. ^ Orr, Conor (December 20, 2017). "2018 Pro Bowl Snubs: What About Jason Kelce, Melvin Ingram or Alex Smith?". SI.com. Time. Retrieved January 22, 2018. ^ Cronin, Courtney (December 20, 2017). "Vikings have four Pro Bowl selections, but Case Keenum and Harrison Smith get snubbed". ESPN.com. ESPN Internet Ventures. Retrieved January 22, 2018. ^ Coller, Matthew (December 19, 2017). "Vikings safety Harrison Smith left off Pro Bowl roster". 1500 ESPN Twin Cities. Hubbard Broadcasting. Retrieved January 22, 2018. ^ "Linval Joseph, Kyle Rudolph, Harrison Smith Named to 2018 Pro Bowl". Vikings.com. Minnesota Vikings Football. January 22, 2018. Archived from the original on 2018-01-23. Retrieved January 23, 2018. ^ Gates, Christopher (January 23, 2018). "Three more Vikings named to Pro Bowl; Everson Griffen, Anthony Barr drop out". Daily Norseman. Vox Media. Retrieved January 26, 2018. ^ "Minnesota Vikings Team Statistics". Minnesota Vikings. January 3, 2018. Retrieved January 3, 2018. ^ "NFL.com Statistics". NFL.com. January 3, 2018. Retrieved January 3, 2018.